On April 20, 2010, an explosion and subsequent oil spill from the Deepwater Horizon oil well drilling platform started the largest marine oil spill in US history, releasing about 180 million gallons of crude oil into the Gulf of Mexico (GOM). The result was a massive oil spill and response involving federal, state, local governments, and private resources to combat the uncontrolled well release over a 3-month period. NRC was one of two national Oil Spill Removal Organizations (OSROs) under contract by the Responsible Party (RP) that responded to the event. NRC launched a massive response effort for the RP and was primarily involved with the oil spill containment, recovery, dispersant application, decontamination operations, and on-site safety supervision for the event. As part of the response, NRC deployed six of its GOM response vessels and 2 oil spill recovery barges and chartered another 300 third party skimming vessels for the immense response effort. The response effort for this historic oil spill brought many “firsts.” Many new skimming systems were tried and there was an unprecedented use of chemical dispersants on and below the ocean’s surface during the response. 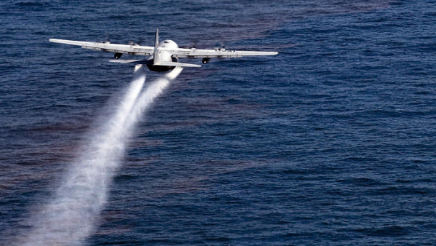 Since dispersants had not been used in large quantities in past US spills, their use raised much discussion within the scientific, public, and political arenas. While questions about the effectiveness in minimizing impacts from oil remain, few debate that the use of dispersants was successful in minimizing the shore side impacts of this spill event.